The Fort Wayne Children’s Zoo is dedicated to the preservation of wild animals and wild places. To that end, we participate in programs and initiatives to protect animals and their habitats both at home and around the world. The Fort Wayne Children’s Zoo is a non-profit organization, accredited by the Association of Zoos and Aquariums (AZA). Look for the AZA logo whenever you visit a zoo or aquarium as your assurance that you are supporting a facility dedicated to providing excellent care for animals, a great experience for you and a better future for all living things. With more than 200 accredited members, the AZA is a leader in global wildlife conservation and your link to helping animals in their native habitats. On May 15, 2015, the AZA launched SAFE. SAFE = Save Animals From Extinction. Click here to learn more about the AZA’s conservation practices. The AZA manages the Species Survival Plan (SSP) to ensure the survival of endangered wildlife species. The Fort Wayne Children’s Zoo participates in 91 SSP programs, Taxon Advisory Groups, and Studbooks to maximize genetic diversity in zoo-dwelling populations. The Fort Wayne Children’s Zoo partners with the Allen County Solid Waste Management District to reduce the amount of waste entering our landfills. 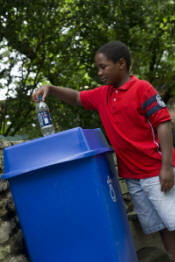 Zoo guests can place aluminum cans or plastic beverage bottles in blue recycling bins throughout the zoo. The zoo recycles thousands of tons of cardboard, steel cans, office paper, and plastic every year. Each year, more than 200 tons of organic material (such as straw, wood shavings, and animal waste) is hauled to Fort Wayne’s Biosolids facility where it is turned into compost, rather than buried in the landfill. The zoo’s Resource Conservation Task Force identifies opportunities to reduce energy use, raise awareness, and save money. In March of 2014, crews installed a storm water quality unit under the zoo’s main parking lot. This will help to keep debris and waste out of the local watershed. The zoo received the 2014 Excellence in Recycling award from the Allen County Solid Waste Management District. A portion of the zoo has been designated as a “No Mow Zone.” By allowing grass and native vegetation to grow, we provide habitat for native wildlife while reducing fuel use and emissions. The Fort Wayne Children’s Zoo is a Bright Green Certified Business, meeting the requirements set by the Northeast Indiana Sustainable Business Council for cost-saving, energy-reduction, and Earth-friendly practices. At the time of certification in 2010, the zoo was just the 32nd business in Fort Wayne to achieve this distinction and the very first park to do so. The zoo was named Sustainable Business of the Year in 2014 by the Northeast Indiana Sustainable Business Council. Bring your old cell phones and handheld electronics to the zoo for recycling – you’ll keep harmful substances out of our landfills and help raise money for conservation projects. Most small electronics contain metals like antimony, arsenic, beryllium, cadmium, copper, and lead which can linger in the environment and have adverse effects on human health. With more than one billion cells phones currently in retirement, there is a huge potential to make a difference! 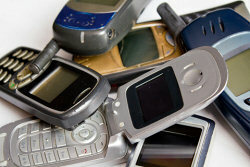 Recycling cell phones can benefit endangered animals. An ore called Coltan (columbite-tantalite) is a source of the element tantalum which is an essential coating for components of cell phones. This ore is mined in gorilla habitats in the Congo. In recent years, the eastern lowland gorilla population there has declined 90% according to the United Nations. Reducing the demand for Coltan can help save these animals and their habitat. Please do not bring desktop computers, monitors, DVD players, VCRs, or TVs. Thanks to the Little Turtle Chapter of the American Association of Zoo Keepers for coordinating the cell phone recycling project to benefit conservation efforts!